Put this inside a scene behavior, or else it will stop working once the game is paused, leaving you stuck in the paused state. As mentioned above, drawing events happen regardless of paused state. I've reworked the article to make it clearer. The "standard pause menu" that some refer to was part of Stencyl 1.x/2.x and no longer exists in Stencyl 3. 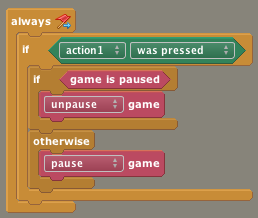 We could not get it to "unpause", as we were using an Event attached to a Pause Actor Button for pause / unpause code blocks. 2) Button Actor / Physics / Advanced / "Can be Paused?" set to "No"
The second seemed the most important, as if the button can be paused, when in a pause state, that Pause Button Actor will be disabled as well. When it cannot be paused, it enables the "unpause" functionality. This is described above, but it is easy to forget the Pause Button (if used) is an actor of whatever type you set, and is also impacted by the Pause event, unless turned off as described above. I have a scene behaviour (which should not be paused, right?) and some commands within WhenGameIsPaused wrapper. Still the commands are not executed until I UNpause the game. Am I doing smthg wrong or...? For me it was not clear why i cannot unpause game on key press event by using "unpause game" block. Yuri - I've added a small blurb on that case. The answer is that pausing does not affect those events. You'll need to wrap them in an if-statement. Roja - That no longer applies to Stencyl 3. In 2.0, Flixel's default binding for p is its internal pause menu. And how to pause a "do every N seconds event" it drops actors to scene. but pause do nothing to it. How i fix this?? for the example to pause u press space, but if u press "p", it will bring up the standard pause menu. Is there any way to get rid of the pause menu?